The rise of industrialism and capitalism during the 19th century brought with it social dislocation, the triumph of the commercial classes and interests, and the creation of an urban proletariat on the ruins of rural life. Smashed asunder were the traditional organic bonds of family and village, rootedness to the earth through generations of one’s offspring, and attunement to the cycles of nature. With the ascendancy of materialism came the economic doctrines of Free Trade capitalism and Marxism and the new belief in rationalism and science over faith, the mysteries of the cosmos, and the traditional religions. The forces of money had defeated everything of the Spirit. As Spengler explained in his Decline of the West, Western Civilization had entered its end cycle. Such forces had been let loose as long ago as the English Revolution of Cromwell and again by the French Revolution. Among the artists in “revolt against the modern world” was the Irish poet William Butler Yeats (1865–1939), leader of the Irish literary renaissance and winner of the Nobel Prize for Literature in 1923. 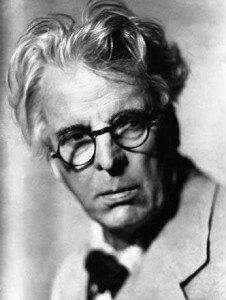 Despite his English and Protestant background, Yeats was involved in the Young Ireland movement, much of his poetry celebrating the Irish rebellion and its heroes. I could not understand where the charm had gone that I had felt, when as a school-boy of twelve or thirteen, I had played among the unfinished houses, once leaving the marks of my two hands, blacked by a fall among some paint, upon a white balustrade. Sometimes I thought it was because these were real houses, while my play had been among toy-houses some day to be inhabited by imaginary people full of the happiness that one can see in picture books. I was in all things Pre-Raphaelite.
. . . I remember feeling disappointed because the co-operative stores, with their little seventeenth century panes, were so like any common shop; and because the public house, called “The Tabard” after Chaucer’s Inn, was so plainly a common public house; and because the great sign of a trumpeter designed by Rooke, the Pre-Raphaelite artist, had been freshened by some inferior hand. I thought myself alone in hating these young men, now indeed getting towards middle life, their contempt for the past, their monopoly of the future, but in a few months I was to discover others of my own age, who thought as I did, for it is not true that youth looks before it with the mechanical gaze of a well-drilled soldier. Its quarrel is not with the past, but with the present, where its elders are so obviously powerful, and no cause seems lost if it seem to threaten that power. Does cultivated youth ever really love the future, where the eye can discover no persecuted Royalty hidden among oak leaves, though from it certainly does come so much proletarian rhetoric? I had made a new religion, almost an infallible church, out of poetic tradition: a fardel of stories, and of personages, and of emotions, a bundle of images and of masks passed on from generation to generation by poets & painters with some help from philosophers and theologians. I wished for a world where I could discover this tradition perpetually, and not in pictures and in poems only, but in tiles round the chimney-piece and in the hangings that kept out the draught. I had even created a dogma: ‘Because those imaginary people are created out of the deepest instinct of man, to be his measure and his norm, whatever I can imagine those mouths speaking may be the nearest I can go to truth.’ When I listened they seemed always to speak of one thing only: they, their loves, every incident of their lives, were steeped in the supernatural. For Yeats the mystical was the basis of both his poetry and his political ideas. He was particularly interested in the Irish mystical tradition and folklore. He saw the peasantry and rural values as being necessary to revive against the onslaught of materialism. He aimed to found an Irish Hermetic Order, an “Order of Celtic Mysteries,” as he aimed to call it, replacing the alien Egyptian gods of Golden Dawn ritual with the Irish gods and heroes. Yeats held that symbols had an autonomous power of their own in the unconscious. It was these symbols, age-long inherited memories, upon which the artist and the poet drew as the source of creativity. To Yeats, “individuality is not as important as our age has imagined.” The daimons of the ancient memories acted upon the individual, and one’s creativity was an expression of these forces. These symbols and images could be brought to consciousness and expressed artistically via magic and ritual; hence Yeats’ involvement in metaphysical societies such as the Golden Dawn and Theosophy. Additionally, the “occult” provided a literally hidden culture that was above and beyond the crassness of democracy, of the herd, and of material existence, hence its being termed the “Royal Art,” where again, as in traditional societies over the course of millennia, a priestly caste, at the apex of a hierarchical society, served as the nexus between the terrestrial and the divine, serving as that axis around which High Culture revolves. Cromwell’s “murderous crew” have brought forth the “money’s rant” on the blood of what is noble. O what of that, O what of that? The specter of Puritanism has haunted the entire world ever since, “far and wide.” Nobility of character, regardless of “class”–itself a vulgarization of the traditional castes–was destroyed by the inauguration in the West of the reign of money by Cromwell, and one that was not overcome, but rather adopted by its supposed “enemy,” socialism, as Spengler was to point out. Yeats, as “The Curse of Cromwell” shows, has been one of the few to realize the full depth and lasting significance of Puritanism under whatever name it might appear. That I am still their servant though all are underground . . .
One product of democracy and capitalism that Yeats feared was the proliferation of those he regarded as inferior people. Yeats advocated planned human up-breeding and joined the Eugenics Society at a time when eugenics was a widely held belief among the intelligentsia. As with his political and cultural views, however, his outlook on eugenics had a mystical basis, relating reincarnation to the race soul. In his 1938 poem “Under Ben Bulben” Yeats calls in eugenic terms for Irish poets to sing of “whatever is well made,” and “scorn the sort now growing up,” “all out of shape from toe to top.” In this poem, there is a mixture of the mythic, reincarnation, the race soul, and eugenics. There is an immortality of the soul that parts one in death only briefly from the world. Still the indomitable Irishry . . . Returning to eugenics, Yeats had “On the Boiler” published the same year, where he endorsed the psychometric studies that were showing intelligence to be inherited, and expressed concern at the proliferation of the unintelligent. A statesman is an easy man. Because this age and the next engender in the ditch . . .
Base drove out the better blood. The aristocracy of old, the noble lineage of blood, of familial descent, has been replaced by the new rich, the merchants, our new rulers are those who measure all things by profit. Here Yeats is portraying history as a cycle reminiscent of a wheel, where the axis around which the civilization revolves is that of Tradition, but as the civilization advances along the path of cyclic decay, it begins to fall asunder as the axis of Tradition is no longer strong enough to hold the edifice of civilization together. “The falcon cannot hear the falconer”: “modern” man in the last cycle of every civilization no longer hears the call of his Tradition, or metaphorically, his “blood.” He is detached and looses the anchorage of the axis of Tradition. Consequently everything falls apart: the civilization dies, and its light is extinguished, existing perhaps only in the form of ruins of once great monuments, of the Coliseum and the pyramids. Although Yeats had worked out his theory of history prior to reading Spengler, he found the coincidence between his views and those expressed in The Decline of The West, “too great for coincidence,” or perhaps what one might call in the Jungian sense synchronistic. One can read in the above what appears to be then the growing tide of Bolshevik revolution amidst the loss of tradition, having described Marxism as “the super-head of materialism and leading to inevitable murder.” The answer is the rise of a strong leader who will get civilization back on course, the “new Caesar” that Spengler later saw in the possibility of Mussolini. With the assumption to Government of De Valera in 1932, the following year Yeats was seeking to formulate a doctrine for Ireland that would be a form of “Fascism modified by religion.” History consisted broadly of “the rule of the many followed by the rule of the few,” again reminiscent of Spengler’s idea of a “new Caesarism” that follows on the rule of plutocracy at the end cycle of a civilization. For Yeats, the rule of the few meant a return to some form of aristocracy. That year, 1933, Yeats met General Eoin O’Duffy, leader of the Irish Blueshirts, whom Yeats thought might be capable of overthrowing De Valera and instituting a sound government. O’Duffy, a hero of the Irish revolt and Michael Collins’ principal aide, created a mass movement, one of the many “corporatist” movements that were sprouting up all over Europe and further afield in the midst of the Depression, and Eire was almost brought to civil war between his “Blueshirts” and the IRA. Yeats approvingly regarded the Blueshirts as part of a worldwide movement of “fascism” and wrote three marching songs for them. These sang of the heroes of Ireland, and of the need for a renewed social order. Take to the roads and go marching along . . . However, Yeats, like Wyndham Lewis, Evola, and others, was suspicious of any movement that appealed to the masses, and of what he saw as the demagoguery of the Fascist leaders in appealing to those masses. This was regardless of the fact that the masses were being won over to national ideals and away from the internationalism of the Communists. Yeats, like other members of the literati who were suspicious of mass movements of any form, had the luxury of not subjecting his ideals to the sobering necessities of a practical political struggle to save civilization from communism and capitalism, which is what O’Duffy and others around the world were then trying to accomplish. But it is not the role of the troubadour to carry out political campaigns, but to maintain the remnants of High Culture amidst the vulgarity of what the Hindus call the Kali Yuga. And in this task, Yeats never wavered. Julius Evola, Revolt Against the Modern World, trans. Guido Stucco (Rochester, Ver. : Inner Traditions, 1995). W. B. Yeats, Four Years 1887– 1891 (Dublin: The Cuala Press, 1921), Chapter 1. Yeats, Four Years, Chapter 2. Yeats, Four Years. However, it might be asked whether the enormous interest in wizardry and fantasy, and in new forms of the heroic epic, in film and literature among present-day youngsters (Tolkien, Harry Potter, and the like) is an embryonic reaction against the modern world. Does this express a yearning for the return of something deeper, religion and the mystical having been driven from life by science, technology, and the shopping mall? Yeats, Four Years, Chapter 17. “Hidden Masters,” supposedly controllers of the world in some remote region such as Tibet, manifesting their desires to lesser mortals through their chosen vehicles, have been in vogue since Blavatsky’s day, and often provide the legitimacy for claims to occult leadership. The famous experiment in Canada of the creation of a group “thought form,” which took on a personality and even a history and name of its own, is a fascinating example of what Yeats seems to be hypothesizing. (The Philip Experiment, Toronto, 1972). Yeats, Four Years, Chapter 19. Here again one could have recourse to Jung’s concept of the Collective Unconscious, although Yeats seems to have developed an analogous theory on his own account. Ellic Howe, The Magicians of the Golden Dawn (Northamptonshire: The Aquarian Press, 1985), pp. 100–102. Terence Brown, The Life of W. B. Yeats: A Critical Biography (Oxford: Blackwell, 2001), p. 119. Brown, The Life of W. B. Yeats, p. 117. Greek, one’s higher intuitive, creative faculties. The pre-eminent 19th Century historian of the occult, Eliphas Lévy (Alphonse Constant) referred to the aristocratic tradition of the occult as elevating the adept to the “rank of kings, because magical initiation constitutes a true royalty . . . characterized by all Adepts as the Royal Art.” Eliphas Levy, The History of Magic (London: Rider, 1982), p. 5. Like Evola and René Guénon, Lévy, a former socialist agitator and Freemason of the Rose-Cross Degree, also warned of an anti-tradition that included Freemasonry and was behind the French Revolution: “The anarchists have resumed the rule, square and mallet, writing upon them the word Liberty, Equality, Fraternity–Liberty, that is to say, for all lusts, Equality in degradation and Fraternity in the work of destruction. Such are the men whom the Church has condemned justly and will condemn for ever” (p. 287). See also: Chapter 4: “The French Revolution.” It is of interest that the French Revolutionary slogan “Liberty, Equality, Fraternity,” also happens to be the slogan of the Grand Orient of France. W. B. Yeats, “Letter to John O’Leary,” 1892. “Money is overthrown and abolished only by blood” (Spengler, The Decline of the West, vol. 2, p. 507). W. B. Yeats, On the Boiler (Dublin: The Cuala Press, 1939), p. 25. John Carey, The Intellectual and the Masses (London: Faber and Faber, 1992), p. 25. W. B. Yeats, Michael Roberts and the Dancer, “The Leaders of the Crowd” (Dublin: The Cuala Press, 1921). Spengler, The Decline of the West, vol. 2, p. 507. Spengler, The Decline of the West, vol. 2, p. 506, n1. Spengler, The Decline of the West, vol. 2, p. 506, n2. Spengler referred to the “analogous historical epochs” of Civilizations in terms of the Seasons, to emphasize the organic nature of his cyclic historical paradigm. Spengler, The Decline of the West, vol. 2, p. 302. W. B. Yeats, “Under Ben Bulben,” 1938. W. B. Yeats, On the Boiler (Dublin: The Cuala Press, 1938). W. B. Yeats, “The Old Stone Cross,” 1938. W. B. Yeats, “The Statesman’s Holiday,” 1938. “The coming of Caesarism breaks the dictature of money and its political weapon democracy” (Spengler, The Decline of The West, vol. 2, p. 506). W. B. Yeats, “The Second Coming,” 1921. W. B. Yeats, A Vision (New York: Macmillan, 1961), p. 261. Allen Wade and Rupert Hart-Davis, ed. The Letters of W. B. Yeats, p. 656. D. R. Pearse, ed., The Senate Speeches of W. B. Yeats (London: Faber and Faber, 1961), p. 173. Yeats had been appointed to the first Irish Senate in 1922 and was reappointed in 1925. Pearse, ed., The Senate Speeches of W. B. Yeats, p. 111. Wade and Hart-Davis, eds., The Letters of W. B. Yeats, p. 808. Wade and Hart-Davis, eds., The Letters of W. B. Yeats, p. 813. Maurice Manning, The Blueshirts (London: Gill and Macmillan, 1970). Manning, The Blueshirts, p. 232. Oswald Spengler, The Hour of Decision, trans. Charles Francis Atkinson (New York: Alfred A. Knopf, 1963), pp. 186–87. However Spengler also believed that Fascism might transform into something else prefiguring a “new Caesarism” (p. 230).